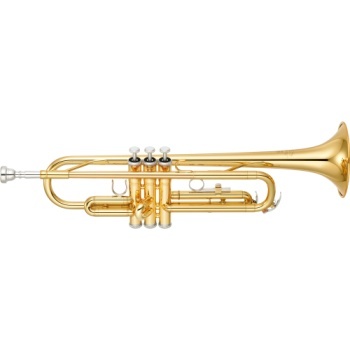 Durable Monel Alloy Pistons And An Abs Plastic Case Make This The Perfect Beginner Rental Trumpet. THIS TRUMPET QUALIFIES FOR JACKSON'S "RENTAL PURCHASE PROGRAM". HONED PISTONS: The precise fit between valve casings and pistons after honing means no air leakage. NICKEL SILVER AT STRESS POINTS: Nickel silver is a very strong material, and when used at stress points, makes the instrument far more durable. DELRIN ONE-PIECE VALVE GUIDES: Delrin one-piece valve guides are durable and quieter than metal valve guides. FIRST VALVE SLIDE THUMBHOOK: Assists in intonation. Honed pistons The precise fit between valve casings and pistons after honing means no air leakage. Pressure-formed tubing Perfectly rounded tubing results in less turbulence and a smoother air flow, thus allowing for an excellent scale and reduced resistance. Laser-fused pluzuma welded bell A high-energy laser fuses the brass together for a virtually seamless bell which allows continuous even vibrations. Nickel silver at stress points Nickel silver is a very strong material, and when used at stress points, makes the instrument far more durable. Delrin one-piece valve guides Delrin one-piece valve guides are durable and quieter than metal valve guides. First valve slide thumbhook Assists in intonation.